A year-long commemoration of the 50th anniversary of integration at Samford University culminated April 9 with public recognition of the 29 African-American graduates who were the inaugural recipients of the Audrey Gaston Howard Award. The award recipients were honored at the annual Samford Black Alumni Association (SBAA) luncheon. The commemoration and awards were coordinated by Denise Gregory, Samford’s assistant provost for diversity and intercultural initiatives. Earlier, award recipients were recognized at a university-wide convocation in February. The award recognizes Samford’s first full-time African-American student, the late Audrey Gaston Howard, who enrolled in Cumberland School of Law in 1967 and graduated in 1970. Gregory noted the honorees are representative of the more than 2,000 African American graduates who have distinguished themselves through exemplary professional achievement and civic and community service. Nominations were sought from the Samford community and the final selections were made by a representative committee of faculty, staff and alumni. 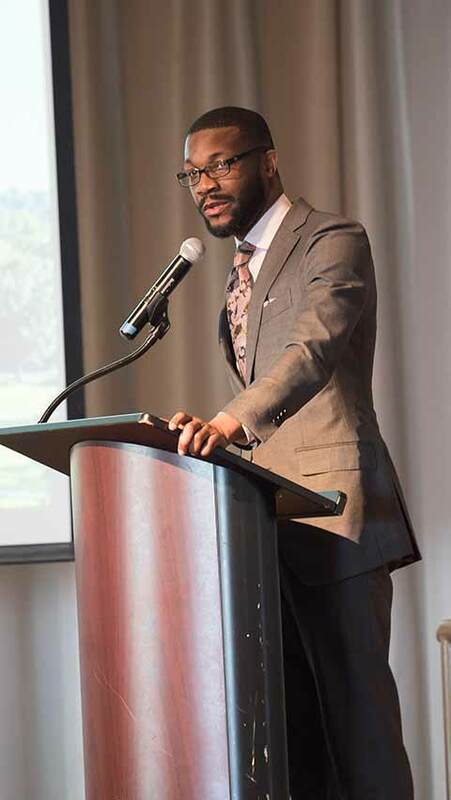 Birmingham Mayor Randall Woodfin was keynote speaker for the April 9 SBAA luncheon. Woodfin is a 2007 graduate of Samford’s Cumberland School of Law. In a foreshadowing of his future role, Woodfin wrote in 2003, “I find it imperative that I aid in reshaping and building a better Birmingham from the ground up. I can begin this by obtaining my legal education at Cumberland School of Law. Woodfin emphasized Samford’s mission to “nurture persons” and that serving others is critical to that mission. Taylore Miller, a freshman religion major from Orlando, Florida, was announced as recipient of the Tiffany Nicole Conaway Memorial Scholarship by the Samford chapter of Delta Sigma Theta. Isaac Cooper was recognized for his four years of service as founding president of the SBAA. Cooper is a 2012 business graduate and currently is a financial advisor in Birmingham. Jewel Littleton-Williams, a teacher in the Birmingham City Schools, is the new SBAA president. Littleton-Williams is a 2005 education graduate. The SBAA luncheon was the culmination of a year-long commemoration that included speakers, lectures, recognition at Samford’s homecoming and other events. Eric L. Motley, a 1995 graduate who was Samford’s first African-American elected Student Government Association president, presented the annual Corts Distinguished Author Series lecture in March.